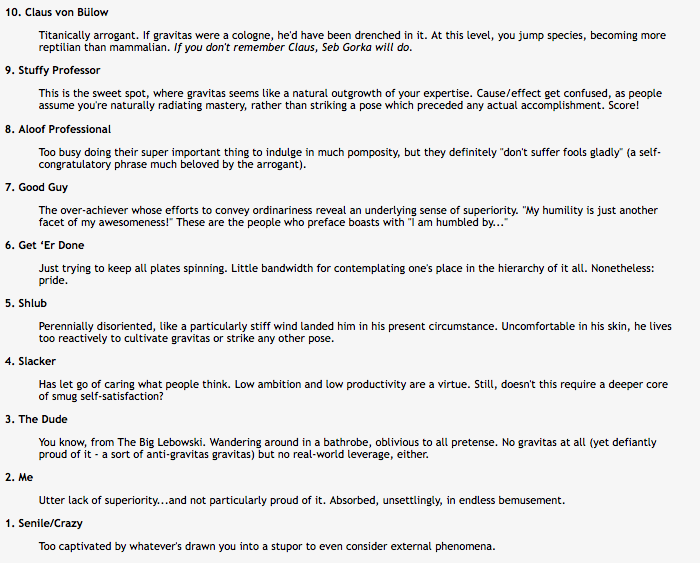 I just noticed a strange compression effect in the levels of arrogance/gravitas listed in my previous posting. Claus von Bülow and Seb Gorka think they're Stuffy Professors. Stuffy Professors think they're Aloof Professionals. Aloof Professionals think they're Good Guys. Good Guys think they're Get ‘Er Done. I feel like The Dude. The Dude feels like a Slacker. Slackers secretly fear they're Shlubs. ....and Shlubs definitely think they're Get ‘Er Done. Get ‘Er Done just get ‘er done. So if you're trying to place yourself, choose one that sounds right, and you belong in the one above if it's 6-10 and the one below if it's 1-4 (get 'Er Done has no time for this introspective nonsense).